Transitory starch metabolism is a nonlinear and highly regulated process. It originated very early in the evolution of chloroplast-containing cells and is largely based on a mosaic of genes derived from either the eukaryotic host cell or the prokaryotic endosymbiont. Initially located in the cytoplasm, starch metabolism was rewired into plastids in Chloroplastida. Relocation was accompanied by gene duplications that occurred in most starch-related gene families and resulted in subfunctionalization of the respective gene products. Starch-related isozymes were then evolutionary conserved by constraints such as internal starch structure, posttranslational protein import into plastids and interactions with other starch-related proteins. 25 starch-related genes in 26 accessions of Arabidopsis thaliana were sequenced to assess intraspecific diversity, phylogenetic relationships, and modes of selection. Furthermore, sequences derived from additional 80 accessions that are publicly available were analyzed. Diversity varies significantly among the starch-related genes. Starch synthases and phosphorylases exhibit highest nucleotide diversities, while pyrophosphatases and debranching enzymes are most conserved. The gene trees are most compatible with a scenario of extensive recombination, perhaps in a Pleistocene refugium. Most genes are under purifying selection, but disruptive selection was inferred for a few genes/substitutiones. To study transcript levels, leaves were harvested throughout the light period. By quantifying the transcript levels and by analyzing the sequence of the respective accessions, we were able to estimate whether transcript levels are mainly determined by genetic (i.e., accession dependent) or physiological (i.e., time dependent) parameters. We also identified polymorphic sites that putatively affect pattern or the level of transcripts. The online version of this article (doi: 10.1007/s11103-015-0293-2) contains supplementary material, which is available to authorized users. The authors thank Thomas Altmann for providing plant seeds and Michael Lenhard for providing access to Realtime PCR equipment. Financial support by the Bundesministerium für Bildung und Forschung (BMBF) within the GoFORSYS initiative and by the University of Potsdam is gratefully acknowledged. 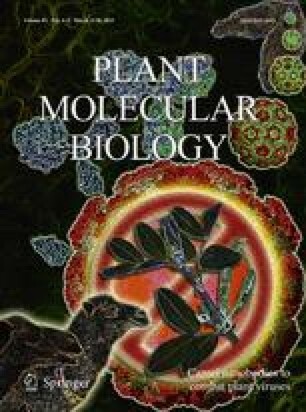 MS thanks the Max Planck Institute of Molecular Plant Physiology, Potsdam-Golm, and the University of Guelph for generously permitting the use of the library. We would like to thank the anonymous reviewer for very useful comments and suggestions.